A sympathy letter to Mr. & Mrs. Noal Macy consoling them for the death of a friend. Martha states that she will try to attend the funeral. 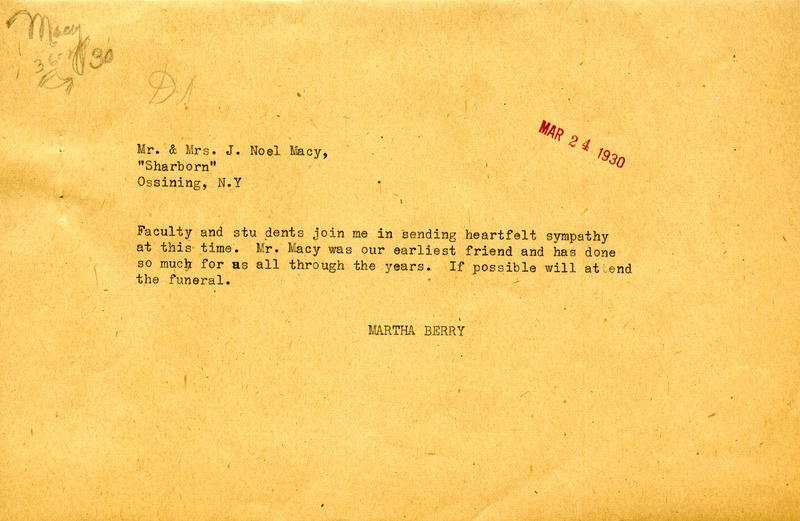 Martha Berry, “Sympathy Letter to Mr. & Mrs. Macy.” Martha Berry Digital Archive. Eds. Schlitz, Stephanie A., Jordan Brannen, Lindsey Dotzel, et al. Mount Berry: Berry College, 2013. accessed April 24, 2019, https://mbda.berry.edu/items/show/13198.